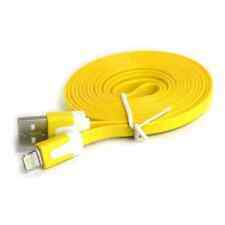 iPhone 5 6 7 8 X Plus Flat USB Colour Cable Charger Yellow BUY 1 GET 1 FREE! Buy 1 get 1 free! Just add 1 to basket and you will receive 2. iphone 5 5s 5c 6 6s 7 7plus 8 8plus X ipad. -Hot Pink-. -Baby Pink-. FLAT ANTI-TANGLE CABLES. -Sky Blue-. Various colours available. Lightning to Micro USB Adapter. iPad (4th generation). Lightning to 30-pin Adapter. iPad Air 2. Lightning to 30-pin Adapter (0.2 m). iPad (2017). iPad (2018). iPad Mini (1st generation). Rocco Premium Standards. Unrivalled Strength - Zinc Alloy Housing for superior durability. FLAT Anti Tangle Cable. MFi (Made For iPhone). Flat TPE cable which you can wind up and put in your pocket or pouch without creating any knots or kinks for extra cable protection. KW1-KW17, PA20-PA38, PA41-PA49, PA60-PA78, PH4-PH44, PH49-PH50, PO (Isle Of Wight) TR (Isles Of Scilly) ZE (Channel Isles). Compatible With Most Android Devices Including Samsung, Nokia And Sony. Flat USB B Micro Cable. Brand New Type C USB to USB Cable - Type C USB (Male) to USB A (Male) charging and data transfer cable. Compatible with the following iPhone 6S, 6S PLUS 6, 6 PLUS, 5S, 5, 5C, iPod Touch 5, iPod Nano 7, iPad 4 iPad 5. Compatible with iPhone 7 6 / 6S / PLUS / 5S / 5 iPad 4 / iPod Nano / Touch. Protection from short circuit. USB Type: V8 Connector. Length: approx.97.5cm/38.4". 50% STOCK CLEARANCE SALE, SO BE QUICK! Energizer High Tech Ultra Flat USB Cable Micro USB 1m Data Charge Phone Tablet. 2 in 1 data sync cable compatible with Android(Does not support type-c interface) and iPhone 5 / 5C / 5S / 6 / 6S / 6P. Cable joint categories:USB,Micro USB. Smooth flat noodle surface,use easily and conveniently. Micro USB Flat Colour Cable Charger Anti Tangle Wire Red BUY 1 GET 1 FREE! Buy 1 get 1 free! Just add 1 to basket and you will receive 2. -Baby Pink-. -Hot Pink-. FLAT ANTI-TANGLE CABLES. -Sky Blue-. Various colours available. Micro USB Flat Colour Cable Charger Wire Samsung Hot Pink BUY 1 GET 1 FREE! Buy 1 get 1 free! Just add 1 to basket and you will receive 2. -Hot Pink-. -Baby Pink-. FLAT ANTI-TANGLE CABLES. -Sky Blue-. Various colours available.